Bethel College and Hesperian College. Peter Rogers Burnett was just four years old when he traveled the Oregon Trail with his parents, Glen Owen Burnett and Sarah Rogers Burnett. His father had preached in Bethel, Missouri. He was named after his uncle Peter who became California's first governor. There is a profile of Glen O. Burnett. Read about Peter Burnett, the governor of California, in Wikipedia. For his early schooling, Peter Burnett attended the Lafayette Academy in Lafayette, Oregon as well as Bethel Institute and Bethel College. He could do this while still living at home. In the fall of 1861 the family moved to Grand Island, near Woodland, California so son Peter could attend the new Hesperian College that opened that Fall. This was among several Stone/Campbell schools that had been launched in California. It was later absorbed into Chapman College. Peter Burnett was in the very first class and graduated in 1864. Many of the pioneer preachers in Oregon had not attended college, although a few had. Peter Burnett, with the help of his parents, built a good educational foundation for his life's work. He was among the first crop of grown-in-Oregon preachers. Others were his friend Levi Lindsay Rowland, Ephraim Badger, John Sutherland and A. L. Todd. Profiles of these and other men of the era are on the Pioneer Preachers Menu. In the fall of 1864 Mr. Burnett returned to Oregon and taught in a private school at Lafayette. Following that experience, he began preaching. 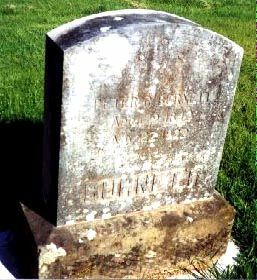 In 1866, Peter married Mary Elizabeth, daughter of Jonathan and Patsey Todd of Yamhill County. Jonathan was later an elder in the McMinnville Christian Church. In 1867, Peter was selected to be the first vocational minister at First Christian Church in Salem. Governor George Woods was one of the elders at the time. Historian John Eliphalet Smith, who knew Burnett, says that he was at Salem 1867 - 1869, 1878 - 1881 and 1888. We have described the Salem Church extensively at this link. The cause of Christ in the State is still making some progress. Several meetings have lately been held over the country, resulting in a number of additions to the church. At a meeting held by Brother Callison in the Umpqua Valley, there were some twenty immersed. Brother Richardson immersed about half-a-dozen not long since, during a meeting held by him. At a meeting held in Salem, the capital of the State, there were five additions. Brother K. Bailes and myself lately held a meeting at which there were fifteen added by immersion, and one who had been a member of the Church of Christ before. Quoted from Christian on the Oregon Trail by Dr. Jerry Rushford. There is a profile of Gilmore Callison. Beginning in 1869 Peter Burnett was the minister at First Christian Church in Sacramento, California where this writer was first exposed to the claims of Jesus 66 years later. There may have been a family connection because his brother, Judge Albert Burnett, was living there at the time. The brethren Burnett were highly esteemed by the people in general. I think that brother Peter's preaching at Ashland will do considerable good in enabling some that are entangled in the meshes of sectarianism, to extricate themselves therefrom. In the Fall of 1883 Peter Burnett organized the Christian Church in Forest Grove. Eugene's First Christian Church considers Peter Burnett as their first minister, although Gilmore Callison was there for about a month at the very beginning before he died. Mr. Burnett was known as "the singing preacher." During his years of preaching, Peter Burnett held ministries in Salem, Eugene, Pleasant Hill, Monmouth, Dallas, Sacramento, Dayton and Waitsburg in Washington, Forest Grove, Hillsboro, and McMinnville. He was effective, baptizing more than 2,000 people into Christ over a span of 55 years. A great tribute was written of Peter Rogers Burnett in the Master's Thesis of Victor Emanuel Hoven. He wrote about a man that lived in the same town, a man that he knew. This was four years before Mr. Burnett's death. He is still living; is tall, straight, slender, dark eyed, dark complexioned, and soft voiced. One is impressed by his fine character, great soul, and decided convictions. He was born in Platt county, Missouri Apr. 9, 1842; came across the plains with his father and Dr. James McBride in 1846. His people have done much religiously and politically for this coast country. His father did a valiant service in the gospel in his day. His uncle, Peter H. Burnett, who came to Oregon in 1843, went to California and became the first governor of that state. His youngest brother, Judge Albert Burnett, lives at Sacramento, Cal. From early childhood Peter R. Burnett had it in his heart to become a preacher of the gospel. In this he was encouraged by his father who selected Peter's reading matter to that end and kept the ideal constantly before him. He tells us that it was his great delight to listen to the preachers, while he was a young boy, as they discoursed on the great themes of the gospel. They always had something to say and knew how to say it so as to interest everybody. His school days began in 1849 when he went to school at Lafayette to T. J. Lyle, who kept a school upstairs in a building in which was a saloon downstairs. Later he attended the school which his father started at Bethel, known first as Bethel Institute and later as Bethel College. From 1861-64 he attended the Hesperian College at Woodland, California. In the fall of 1864 he returned to Oregon, entered into partnership with Abigail Scott Duniway in a private school at Lafayette, and had a very successful school that winter. In 1865 he began preaching for the Church of Christ and in Oct. 14, 1866 he was married to Mary E. Todd. His preparation for the ministry, aside from his general schooling, consisted in reading Greek for three years, one full term of which was spent in reading nothing else but the New Testament in Greek. In addition to this he read the writings of the Fathers of the Restoration movement and all the sermonic literature of which he could get possession; but the Bible was the book he constantly studied. From this it will be seen that he, with all the rest of the pioneer ministers, was a well educated man. In 1867, through the influence of Geo. L. Woods, then governor of the state of Oregon, and other members of the Church of Christ at Salem, P. R. Burnett was called by that church to become their minister, in which capacity he served them till 1869. That year he went to California where he preached for two years and then returned to Oregon. In 1878 he was recalled to Salem, and also in 1888. Besides he held pastorate at Forest Grove, where he held a meeting in the eighties under the direction of the State Board and established a church. At McMinnville and Eugene, he served as minister at two different times in each place. His other pastorates were at Monmouth, Pleasant Hill, and several country churches. With modesty and humility he told me that he was the only preacher in the country who "stuck to the work through thick and thin," through prosperity and adversity - excepting some old time preachers who had farms and were supported only in part by their preaching. When out of a "job," he would go to some destitute point and make a place to preach. More than once did he do this, and, as a result, he established many new churches and served them as their regular minister. Peter passed from this life in 1922 when he was struck by a car as he returned home from a prayer meeting in Eugene. He had outlived Mary Elizabeth by six years. They are buried in the 27 acre Masonic Cemetery west of McMinnville, Oregon. Below is the headstone.